Fast optical flow computation using OF_DIS. Computes horizontal and vertical optical flow into two separate optical flow maps. This module is intended for use as a pre-processor, that is, the images sent out may be further processed by the host computer. mid-grey for no vertical motion. You should be able to run this algorithm at 100 frames/s with 176x144 video camera resolution. "Fast Optical Flow using Dense Inverse Search" by Till Kroeger, Radu Timofte, Dengxin Dai and Luc Van Gool, Proc ECCV, 2016. Have JeVois point towards an otherwise static scene, and swipe one finger in front of it, either moving from left to right of the field of view, from top to bottom, etc to confirm the different greyscale values as described above. Definition at line 73 of file OpticalFlow.C. Definition at line 77 of file OpticalFlow.C. Definition at line 81 of file OpticalFlow.C. Definition at line 84 of file OpticalFlow.C. 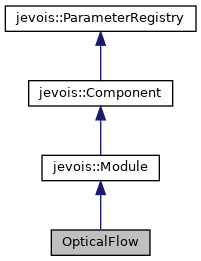 References jevois::rawimage::convertToCvGray(), jevois::rawimage::cvImage(), jevois::RawImage::height, JEVOIS_REGISTER_MODULE(), jevois::RawImage::require(), and jevois::RawImage::width.